The brand new logistics vessel «KNM Maud» sailed its maiden trip to the USA where it picked up loads of ammunition and military equipment. The new vessel named after the first queen of independent Norway can carry up to 200 tons of ammunition, 30 tons of foodstuff, as well as boats, vehicles and big volumes of fuel. It is the biggest vessel ever operated by the Norwegian Navy. 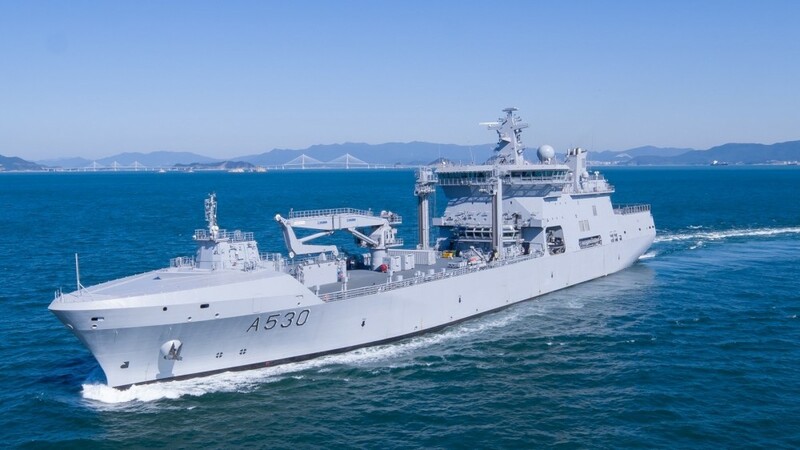 Ahead of its arrival in naval base Haakonsvern near Bergen this week, the ship sailed to the U.S port of San Diego where it loaded military equipment, ammunition and spare parts to the F-35 fighter jets, the Norwegian Armed Forces informs. «The «KNM Maud» is important for the strengthening of operations and endurance of the Navy’s other vessels, and logistics vessels is a much-needed resource for NATO,» Norwegian Prime Minister Erna Solberg says in a statement as the new ship on Friday made port call in Haakonsvern. The 183 meter long vessel is built in South Korea and is due to be fully operational in the course of 2020. It has a core crew of 43 people and an additional crew of 116. The primary task of the ship will be to provide supplies of fuel, foodstuff and equipment to other Norwegian naval vessels and consequently extend the Navy’s operational endurance at sea, the Norwegian Defense Material Agency informs. It will also be able to assist in action aimed a protecting sovereignty and offer support to other military units, take part in search and rescue and humanitarian operations. «The Navy must be able to operate in the north over longer periods, bot at sea and along the coast,» says Minister of Defence Frank Bakke-Jensen. «With logistics at hand our ability to do surveillance of the nation’s most important areas is significantly enhanced,» he underlines in a comment.